We’re singing Pharral Williams’ song “Happy” in my women’s chorus that I joined this month. It’s impossible to be unhappy while singing this song and it got me thinking about happiness. I know it’s easier to take good care of ourselves when things are going well in our lives and we are happy. But on some days, it’s tough to find something to smile about. What’s the truth about happiness? How much am I responsible for my own happiness? It seems, quite a lot. 1) There isn’t much people can do to change how happy they are. Some people are just happier than others. False. Researchers have found that genetics and temperament form a baseline or “set point” for happiness. However, genetics only explains about half of our happiness level, and life circumstances beyond our control are only another 10% or so. That means 40%—nearly half—of our happiness level is determined by our own choices and actions. Even people with a more melancholy temperament or difficult life circumstances can be happier with some effort. Happiness is subjective—each of us has our own individual experience of happiness—but it can be studied. Researchers accumulate data on happiness by asking people to report their levels of happiness. Since our memories are not always very accurate, scientists design studies to collect reports on happiness “in the moment” as well as asking people to reflect on their overall happiness levels. Studying happiness is like any other field where we have to rely on people’s own reports of their experience. 3) Happy people aren’t very bright. False. There’s a stereotype in our culture that happy people aren’t very bright, or they’re naive. This stereotype is not at all accurate. There’s no relationship between happiness and education or IQ. And happy people tend to be more successful at work; have a higher income; are viewed as more likable and attractive; have better relationships; get and stay married; are healthier; and live longer. 4) Young people are happier than old people, and people get less happy over their lifetimes. False. Older people consistently report higher levels of happiness than young adults, and this research has held up over time, so it’s not a matter of some generations being happier than others. A big part of the difference seems to be that younger people experience more negative emotions like anger, anxiety and shame. Seniors tend to experience fewer negative emotions and with less intensity. 5) Money makes people happy. False. Once people have enough money or income to meet their basic needs and stay out of poverty, wealth and income don’t make as much of a difference to how happy people are as you might think. People with more money are slightly happier than people at lower income levels, but it doesn’t seem to be the money so much as satisfaction in earning it and giving it away. And a windfall typically doesn’t make people more happy than they were before. People who get a big raise or win the lottery tend to settle back to their previous level of happiness before long. 6) “I’ll be happy when….” Maybe. It’s easy for people to think that they’ll be happy once something they want happens. This is usually not the case, however. People are not very good at predicting how happy (or sad) an event will make them or for how long. We are very good at adapting to changing circumstances, so even though we may be happier for a short time, we often revert back to our prior levels of happiness. 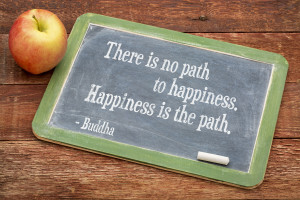 Happier people are ones who tend to enjoy the journey, cultivating relationships and positive emotions along the way. 7) People who think about their own happiness are self-indulgent and selfish. False. The opposite may be true. It may be that the best thing you can do for other people is to be happy yourself. Research shows that happy people boost the happiness of others in a wide network through three degrees of acquaintance. The happiest people are the most engaged with others and the least wrapped up in their own problems. Happy people are more likely to express positive emotions like gratitude, altruism, and forgiveness. Can Reading Make You Happy? You got me thinking about happiness. I think this is actually the happiest time of my life. I like being retired. Choosing to spend time with friends that are special – that always brings me happiness and being able to sit in my office, listen to Pandora and write. The writing is cheaper then a therapist and very therapeutic. Enjoyed the Happiness Bank Video. Plus if anything or person starts to make me feel sad, then I just pray about it and turn that problem over to God. So good to hear that you know what your happiness looks like and you’re living it, Dana. Congratulations and thanks for stopping by. What an amazing post, I love it and thank you so much for thinking of the Happiness Bank when you wrote it Carole. How cool that you are singing Pharral William’s song Happy, in your choir. I used to sing in a community choir a couple of years ago and I always came away from those Sunday nights feeling uplifted. Singing takes me out of my head and into my heart and just for a few hours when I was singing with a group of like minded people I didn’t have a care in the world. Thank you, Claire, so glad you stopped by to see that I am always telling people about your great web site. Since I revamped my blog this summer and turned it into a web site, everyone who was following my blog has to sign back up. I wasn’t sure how to let you know that. Yes, singing can be an out-of-body experience for me, too, I just have to get out of my head and stop worrying about what I can’t do and focus on what I can. Thanks again for stopping by FuzzyRedSocks. Ain’t that the truth! Thanks, Dana.